Joanna Trollope has been writing for more than 30 years. Her enormously successful contemporary works of fiction, several of which have been televised, include Other People's Children, Marrying the Mistress, Girl from the South, Brother & Sister, Second Honeymoon, and Friday Nights. She was awarded the OBE in 1996 for services to literature. As Trollope portrays the dissolution of a marriage, she also explores the effects of that dissolution on the members of the families it affects. Discuss some of these effects, as well as the ways Guy and Merrion's respective family members cope with their relationship. Three of Trollope's characters are mothers, yet each woman is markedly different. Discuss and compare Laura, Carrie, and Gwen's mothering styles. How has each, for better or worse, helped shape the lives and personalities of their children? What do you think of Trollope's treatment of Laura? Do you think she is fairly drawn as a character? How do your feelings for her change over the course of the novel? Compare the marriages of Guy and Laura, Simon and Carrie. What role does age and socio-economic background play in these relationships? Likewise, compare the roles of the children of these marriages. How are Jack, Emma, and Rachel's relationships to their parents different from that of Simon and Alan? Discuss Guy and Merrion's relationship. Do you think they were right in their decision not to get married? Does it anger you that their affair, which caused such turmoil in their families' lives, never ends in marriage? How large a role did the forbidden element of adultery play in their relationship? Was theirs a true love tragically thwarted by the constraints of society, or did they merely fill a void in each other's life? Guy and Merrion's relationship begins to change after Jack seeks out his grandfather's help with his own romantic problems. Why is this such a pivotal event? What impact does Jack and Guy's new closeness have on Merrion? Although the Stockdale family is not large, it extends through three generations, and nearly a dozen people. By contrast, Merrion's family is small—just her and her mother. How does having a family help, and hinder, Guy? Of all the many different kinds of family relationships portrayed in the novel, discuss which, if any, you identify with—and why. How do you think Trollope chose the title of this novel? What sorts of images does the word "mistress" invoke? Does Merrion seem to you like a typical mistress? Why or why not? 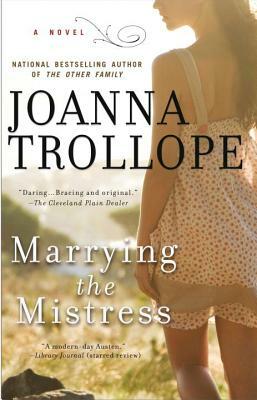 What sort of comment do you think Trollope might be making about infidelity and marriage? Imagine that Marrying the Mistress was made the basis for a debate about family values. How would that debate play out? What arguments does the novel provoke? Do you think it supports the idea of family values, or calls it into question?